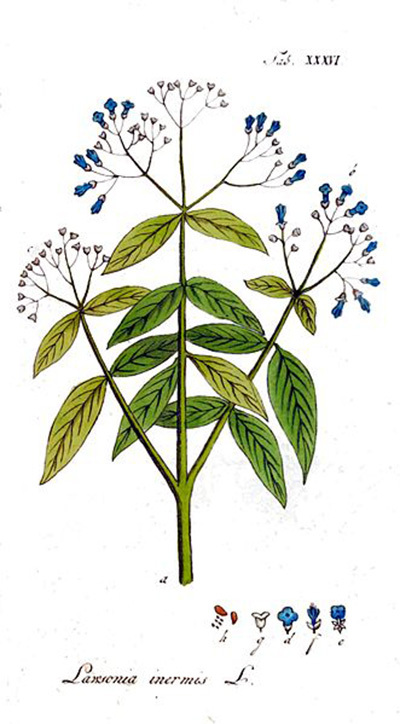 Henna, Latin name Lawsonia Inermis, is a variety of flowering shrub or small tree. It bears fragrant flowers and is native to tropical arid zones and tropical savannah in regions of northern Australasia, Africa, and Southern Asia. Henna is cultivated commercially in many parts of India, Africa and the Middle East. Many people in the West think of henna merely as a hair dye and cosmetic ingredient, yet various parts of the plant have been used in herbal medicine over the centuries, for numerous conditions. 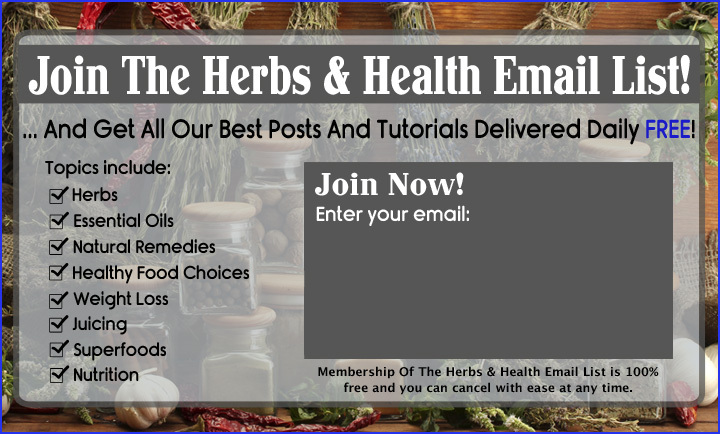 Medicinally, the leaves, roots, flowers, bark and seeds of the plant are all used. There is also an ancient traditional oriental form of temporary body art using the henna plant, known as Mehndi, often used in ceremonies and rituals. The leaves of the henna plant are ground into a fine powder, then mixed to form a paste. This is applied to the skin in decorative patterns. Mehndi has seen an explosion in use in the West since the 1990's, both within a more traditional context of use for ceremonies such as weddings, and also in the form of "henna tattoos" in popular culture. Henna is also used to dye leather, wool, and textiles. In Morocco, the people do elaborate henna designs on leather and stain the skins of frame drums and lamp shades. "Cyprus is a tree having leaves upon the spriggs thereof like the Olive, but broader and softer and greener, the flower thereof being white, mossie, and of a sweet smell, but ye seed black, like unto the fruit of Sambucus: the best grows in Ascalon and Canopus. The leaves have a binding power, werefore being chewed, they help the ulcers of the mouth, and being applied as a Cataplasme they cure all other hot inflammations, and Carbunckles. A decoction of them is a fomentation [to be used] by such as are burnt with fire. The leaves macerated in the juice of Struthium, and beaten small, and so anointed on, doth dye the hair yellow. The flower being beaten small with Vinegar and layd to the forehead, doth cause the pains of the head to cease. But the unguentum Cyprinum that is prepared of it, becomes heating and mollifying of the Sinewes, being of a sweet smell, that it takes unto hot medicines when mixed with them." One of the most important scents of ancient Egypt was called Kyphi. It was a blend of botanicals most certainly including henna, used as a sacred incense and perfume. Gul Hinna Attar (Henna) figures into some of the romantic stories of a bygone era. Its patrons included great poets like the legendary Mirza Ghalib. When Ghalib met his beloved in the winter, he rubbed his hands and face with ittar hina. Note - it is important to note that commercial henna preparations often contain other ingredients, some of which may be toxic. 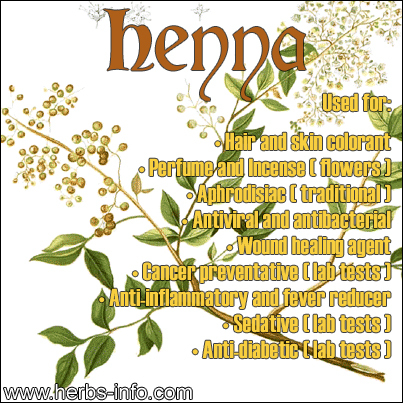 The medicinal qualities of henna described here deal with pure henna derived from the plant. See safety note at the end for more info. (Note - this is not medical advice). 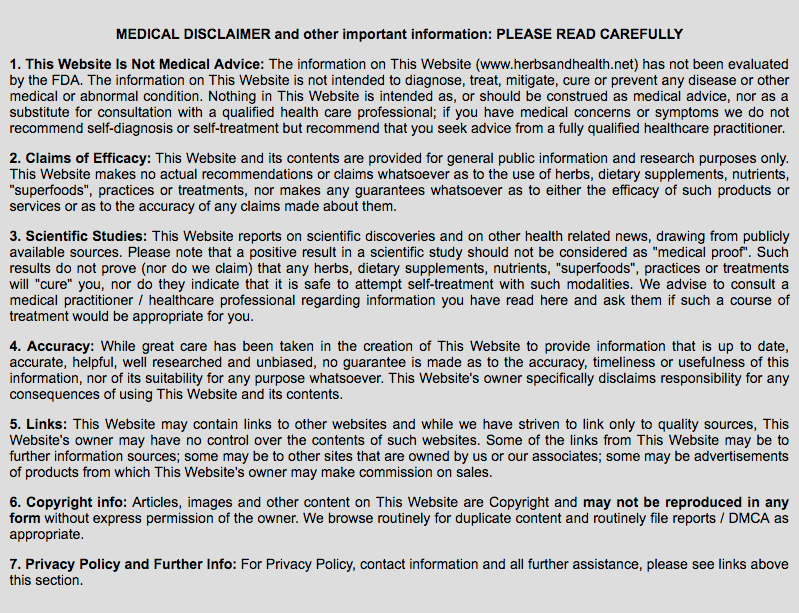 There are a number studies listed on Pubmed of negative reactions to henna.